Warner Bros Horror Made Here 2017 Review: You'll Float, Too! At Warner Bros Studios Horror Made Here: A Festival of Frights, you'll float, too! Warner Brothers Studios throws their hat into the Halloween ring with Horror Made Here: A Festival of Frights, and the results land somewhere between Halloween Horror Nights at Universal Studios Hollywood and Paramount Pictures After Dark Tour: Tales from the Other Side. Horror Made Here is not a full-blown Halloween theme park attraction, but it is much more than the usual studio tour with a seasonal overlay. 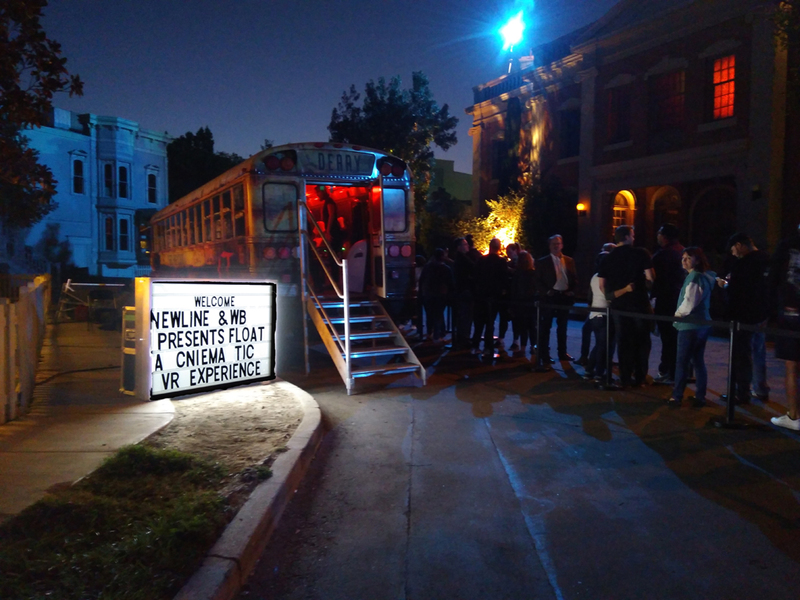 Besides a visit to a stage loaded with props and a tram ride around the lot, the night-time event includes three walk-through mazes based on Warner Bros franchises, a virtual reality "bus ride," and a small town square with a festival atmosphere at the center of the other activities. First stop on the Horror Made Here tour is Stage 48: From Script to Screen. 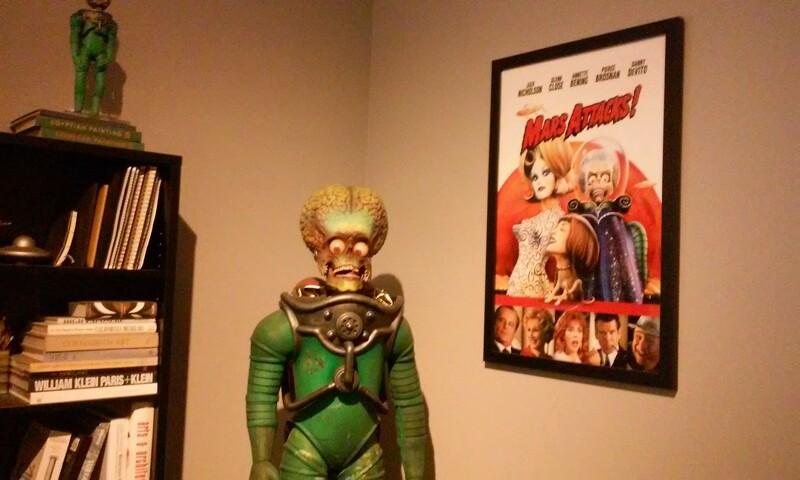 Though available on the year-round daytime tour, this fits the season perfectly, filled as it is with props and costumes from such films as Mars Attacks!, Corpse Bride, Blade Runner, and The Matrix. One difference between Horror Made Here: A Festival of Frights and Halloween Horror Nights is that Warner Bros uses actual props and costumes from their own properties. For Halloween 2017, the studio is emphasizing displays from the blockbuster feature film version of Stephen King's IT and the Annabelle doll and costumes worn by the demon Bathsheba in The Conjuring. There are also numerous displays related to special effects techniques such as green screen, motion capture, and forced perspective. If you stand in the right spot, you can swing your arms and see Harry Potter's friend Dobbie mimic your moves. Or two of you can take a picture at Frodo's table from The Lord of the Rings: one of you will appear Hobbit-sized. Elsewhere, a quidditch broom rides atop a mechanical mount in front of a green screen, where special effects can be added later; there is also the "batpod" from The Dark Knight. Visitors can ride either one and see themselves optically inserted into background footage from the films; the results are available for purchase. Like Stage 48, the tram ride is part of the regular daytime tour, but it is considerably spookier at night. Along with the usual studio history, the driver's commentary emphasizes Warner Bros' horror titles and horror films from other studios that shot on the lot (such as the T-Rex chase from Universal Pictures' Jurassic Park). Sights include the street scene where Hoyt Axton purchased Gizmo the Mogwai in Gremlins (1984) and an appearance by Blanche and Jane Hudson from Whatever Happened to Baby Jane? 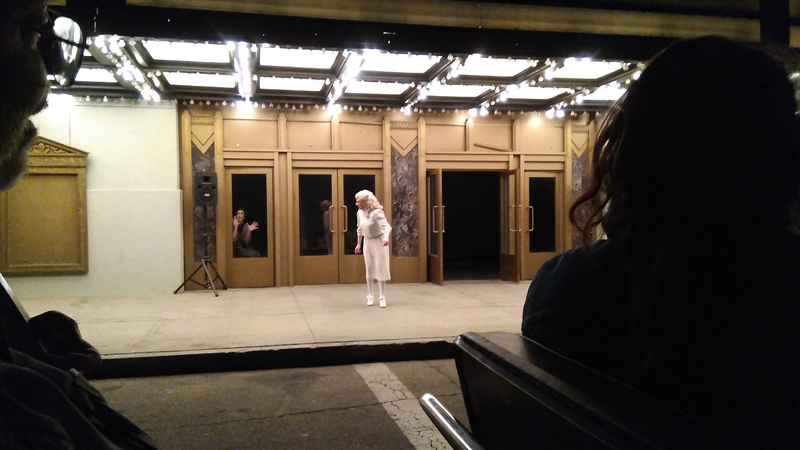 (1962), the filming of which was recently depicted in the series Feud, starring Jessica Lange as Joan Crawford and Susan Sarandon as Bette Davis. There are some scares, too. The Jungle area is haunted by vampires from True Blood. There is a cemetery inhabited by the walking dead. The zombies are not fast, but neither is the tram - pray they do not catch you. 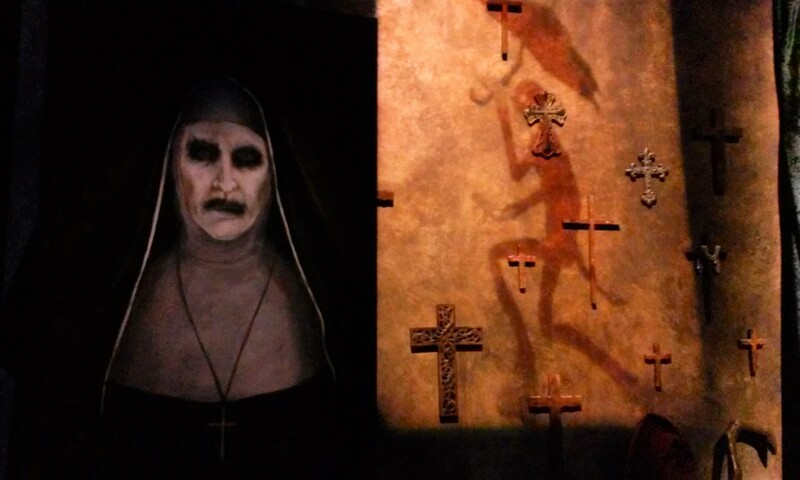 Horror Made Here 2017's attractions include walk-through haunted houses based on IT, A Nightmare on Elm Street, and The Conjuring. 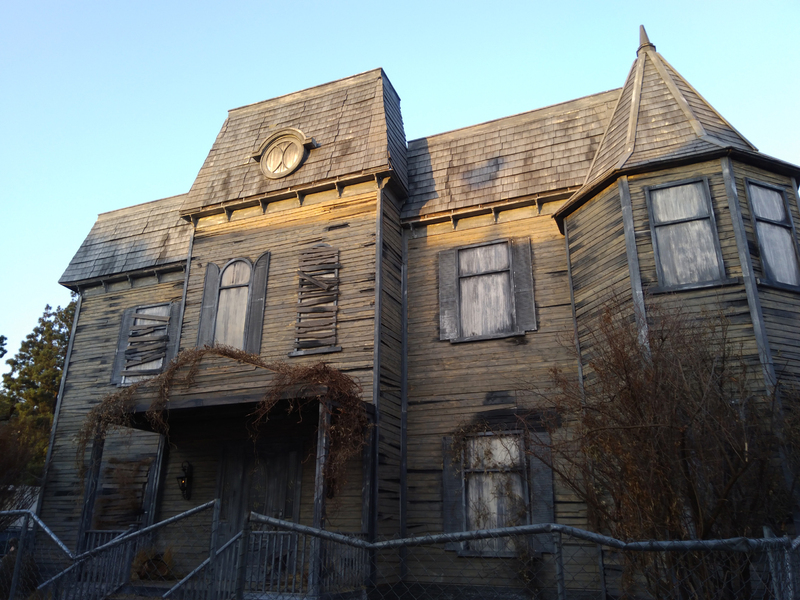 The Neibolt House is essentially the same attraction seen in Hollywood last September to promote the theatrical release of IT, with some new effects and a few more actors added to increase the scare factor. It's a wonderfully detailed haunted house, presented as a guided tour with the unfortunate Georgie from the film leading visitors from room to room and then down into the sewer for a confrontation with Pennywise. The Conjuring turns out to be the highlight of Horror Made Here 2017. Like this Neibolt House, this is a guided tour, supposedly of the artifacts collected by the Warrens (the real-life psychic investigators portrayed in the film). Things go bad almost immediately when the relics display supernatural manifestations, and the Annabelle doll seems to have escaped. This haunted house ends with an excellent special effect: the silhouette of the demon Bathsheba floats along the wall, aligning itself with a portrait, which then emerges from the wall, an insubstantial shadow suddenly taking physical form. Absolutely amazing! Virtual Reality continues to encroach on Halloween. This is the third VR attraction we have experienced this season (including ones at Castle Dark theme park and the Into the Black Halloween Haunt). Fortunately, each one has had its own distinct features. The IT Virtual Reality Bus Ride gets off to a dubious start, making visitors wait in a simulated sewer tunnel far too long, with only an occasional blast of dank air to break the tedium. But once you take a seat inside the bus and put on the goggles, the wait becomes worthwhile. The immersive 3D "ride" simulates a continuously moving tour featuring highlights from the movie, rendered with computer graphics. The 360-degree virtual environment benefits from swivel chairs, which make it easier to spin around and see what lies behind. While racing down the street, you can even look backward, for an effect similar to looking out the back window of a moving car. We found the IT VR ride more marvelous than terrifying, but the sense of being swept along, involuntarily, was a real Adrenalin booster. The experience is enhanced with motion simulation: at one point you rise to a vertigo-inducing height before plunging back down into the sewer for a final, shocking encounter with Pennywise. The live monsters at Horror Made Here may not touch you, but the VR Pennywise has no such inhibitions. The irony of Horror Made Here: A Festival of Frights is that Warner Bros did not make its name in the horror genre. The studio originally became famous for gangster movies and tough-guy pics, though it did occasionally turn to scaring audiences with Doctor X (1932), Mystery of the Wax Museum (1933), and House of Wax (1953). It's really New Line Cinema that got Warner Bros into the horror business, so the studio's presentation emphasizes recent product rather than classics. 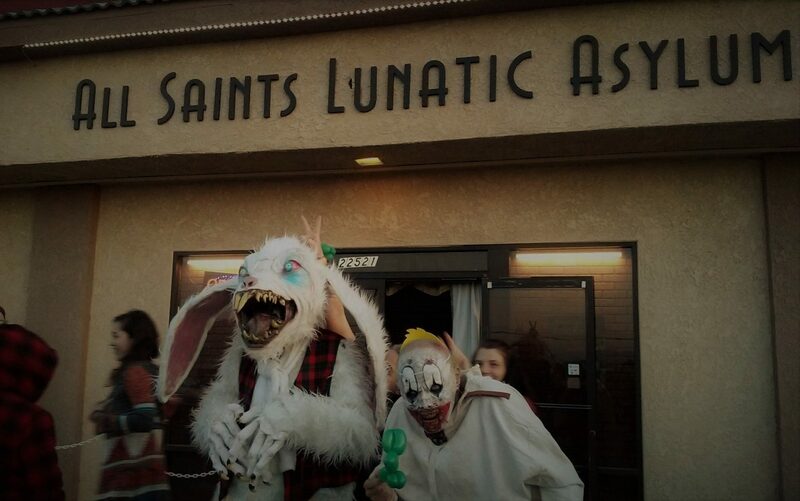 That leaves Horror Made Here a little bit short of franchises to exploit for Halloween attractions. We enjoyed everything they have to offer, but we would have preferred even more. Horror Made Here 2017 is roughly the equivalent of a multi-haunt attraction - there is a bit more here than is available at the Los Angeles Haunted Hayride. 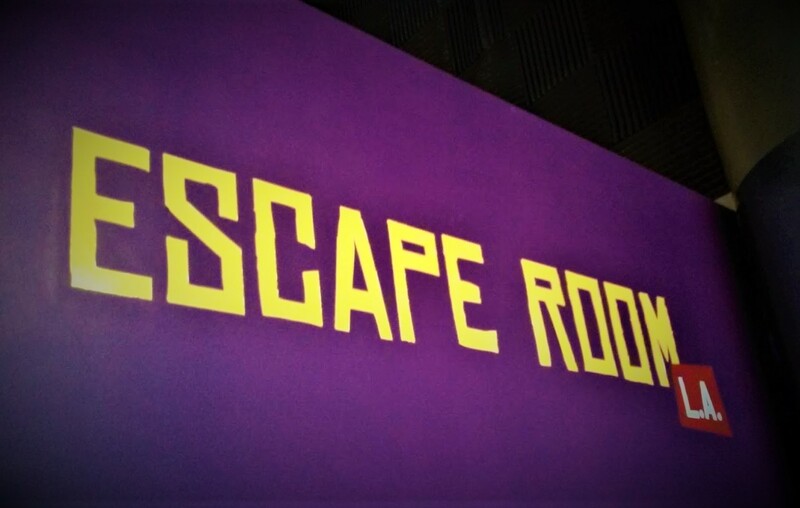 On the plus side, the event features actual props, and the walk-through mazes are housed in convincing environments, not cheesy fun-house imitations. With a more overwhelming multitude of monsters haunting the lot, and a few more mazes, Horror Made Here could hit critical mass. Warner Bros Horror Made Here: A Festival of Frights continues on October 21, 26, 27 & 28. Tickets run from $69 to $79. Warner Bros Studios is located at 3400 Warner Boulevard in Burbank. The website for the event is: wbstudiotour.com/horror-made-here. Real props and costumes, plus convincing settings for the mazes, create a convincingly spooky Halloween attraction that left us wanting even more.